Previously, I connected a u-blox GPS to an arduino and got it functioning. Today I connected it to my Raspberry Pi, got the GPS daemon running, figured out how to get GPS information from the command line, and finally made the GPS an NTP clock source for the RPI. which I purchased from yourduino.com for a mere $28. I chose to connect the GPS to the RPI (Raspberry Pi) using a USB port. It is possible to connect it to the RPI’s serial port, but this is more complicated and has some risk associated with it. If you want to use the serial port, instructions are easy to come by. If I were going to permanently connect the GPS to this RPI, then I might consider using the serial port. The lines in bold font are new after connecting the GPS. 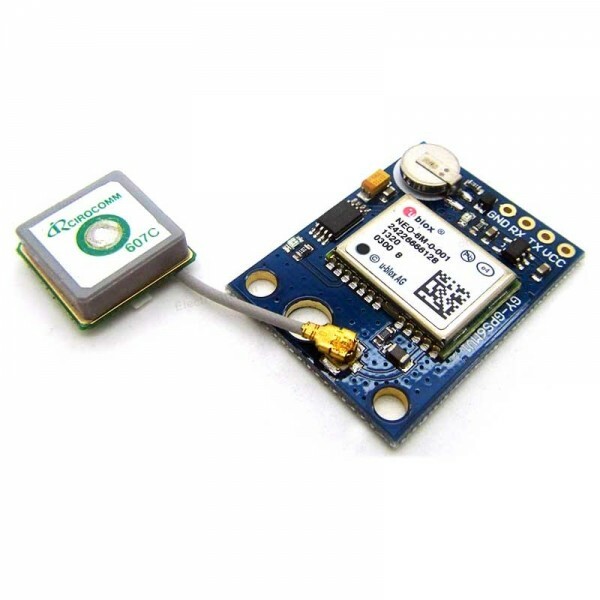 The GPS is connected to device /dev/ttyUSB0. You have now verified the connection to the GPS has been established. 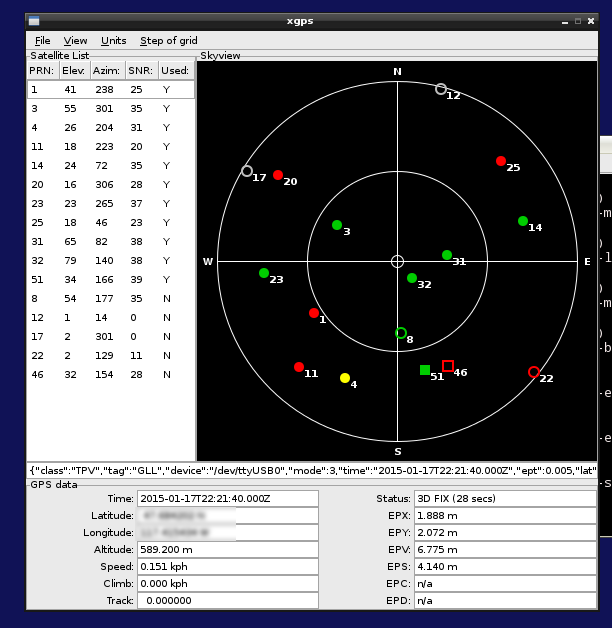 The GPS daemon, gpsd, reads the output from the GPS and makes it available to the rest of the system. By placying the device name in the options field, you will get the GPS to start properly at bootup. I am really just interested in extracting locational information at the shell, at least for the moment. This is a bit messy, but could be cleaned up with something like SED to return, say, just the latitude and longitude. I spent more time learning the ins and outs of NTP for this project that I would have expected, though just scratched the surface. It turns out using a navigation GPS such as this u-blox NEO-6M isn’t considered very accurate. In general, NTP will prefer using an internet based clock over the GPS unless you account for the GPS latency (my word). To use a GPS as a really accurate clock, you need one that provides a PPS (pulse per second) signal. This is a highly accurate clock pulse coming off a pin on the GPS that NTP can use. If you have such a GPS the resource below is a must read. Perhaps using a nav GPS on an RPI won’t result in a super accurate clock, but that’s OK for my purposes. If I’m putting a GPS on an RPI, it is because I don’t have an internet connection to begin with so as long as the clock is right within a few seconds, I’m OK with that. And in my testing, I seem to have no trouble achieving that. In learning about using GPS as a clock source, I also stumbled across DCF77 . This is the radio based the signal that many clocks now use to keep set accurately. They have the advantage of being able to work w/o needing clear view to the sky. I may have to play with one of those some day. First, to get NTP to see your GPS, make sure you use dpkg-reconfigure gps as outlined earlier. I would suggest renaming your current ntp.conf file to something like ntp.conf.old, and then creating the file above. Once you have the GPS providing time properly, then make the necessary changes to the original file and put it back into position. Note that the pool command is commented out. There should be no pools nor servers except for server 127.127.28.0 for the time being. Type service ntp restart to restart ntpd and load in the new ntp.conf file. At this point, ntpd and gpsd should both be running and gpsd must be running with the -n /dev/ttyUSB0 option as outlined above. You should see an asterisk (*) next to the SHM which indicates ntpd has selected it as the clock source. If it isn’t, wait a while. I normally see it get selected within a couple of minutes of restarting ntpd. If when stays at ‘-‘, then ntpd is NOT talking to the GPS. The most likely culprit would be wrong options. Go back to the top of this procedure where I have you do a ps aux and make sure that process is working correctly. On your PC, resync its clock to be sure it is accurate (mine updates only once every few days and in that time ends up being several seconds out of whack). Now compare the RPI date command to the PC’s clock. You should be within a second. In my testing, at this point I’m usually 1 sec slower than the PC. At this point, your RPI is using the GPS clock and is at most 1 second off. As I said before, I would usually be happy enough with this result; however, if you want to spend some ‘time’ calibrating the GPS clock, you can make it more accurate. The rest of this procedure outlines how I did that. If you really, really want an accurate clock, well, buy a GPS with a PPS pin. If you want to do the best possible without a PPS pin, wade thru the GPSD Time Service HOWTO document – he will show you how to use statistics to get the clock really accurate. I short-circuited his work into a pretty quick and easy process. Not as accurate, but way more accurate than the default configuration. In this procedure, I will bring up 4 internet clock sources and make the GPS a stratum 10 device. This will force ntpd to pick one of the internet clock sources. We’ll then use the reported offset for the GPS to correct its latency. By the way, if you aren’t in the US, drop the us. part of the pool DNS so it just reads pool.ntp.org. [....] Stopping NTP server: ntpd. [....] Starting NTP server: ntpd. You should have 4 internet clock sources as well as your GPS and the stratum column (st) should have a 10 for the GPS. In the fudge command, I have removed stratum 10 (allowing it to return to 0) and sped the clock up 150ms. This should be accurate enough that ntpd will select the GPS as the primary clock. On the last line, the offset indicates the difference in time between the RPI’s clock and the time server. In this example, it is 3.681ms. Pretty darn close! to your old ntp.conf file and reinstall it. If you don’t intend to use internet based clocks you can remove the pool command or any other server commands you might have. This entry was posted in c-rpi and tagged gps, gps rpi. Bookmark the permalink. Cool project. I want to use this GPS module too. Have you made any new project with it? Thanks for the catch…just fixed. thanks by share! your information has been realy helpfull! Have you tried using pin 3 of the ublox chip? It has PPS apparently. I am looking for a way to keep the time without having GPS on all the time. Do you think it would be posible to use the PPS time to set a Real Time Clock which is connected to the raspberry pi’s I2C? It appears to me only the 6T will generate that signal. If you find that to not be the case, let me know! I havent connected it to the pi but I did manage to break out the pps pin with a small wire and steady hand. I probed it with my scope and output was as expected. Hey John, good job, I’ll use the Neo 6-M with a hack for take raw data from but now i’m using a G-Top GNSS module that output NMEA0183 sentences. Well, I have a question about the use of grep instruction. What means ‘grep -m 1 lat’ ? I want to take information from two or three GNSS modules but when I get the lat, lon and time information using that commands, I have a delay of 5 seconds. That is a not so good results because I’m trying to do a satellite compass so I need the output from the antennas close to the same time. grep -m 1 will stop processing after it hits its first match. That is, you will never get more than 1 output line. I used that for the examples to limit the output. It is unlikely you would want to use that for any real program. Hello, thanks for your post! May I use a RJ45 able instead of this FDTI cable? The RJ45 has both R and Tx. I’m in a hurry and I couldn’t find any RDTI in my city. Oh I see. i think it’s not going to work then. In this case, I can use a RS232 cable, can’t I?